MASSIVE 500ltr Grit / Salt Bin and Storage box! 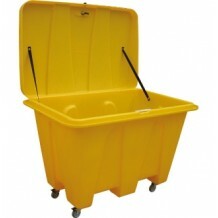 Incredibly versatile suitable for outdoor storage of grit, salt, spill equipment etc... Largest in range, can optionally be fitted with wheels to ease transportation. Minimum order quantity = 1. DEAL: Pay only £12 for extra items!